There are also side effects of the growing solar power industry. Over the past few years, the notion of harnessing the power of the sun to generate electricity and heat has gained a great deal of steam. Its popularity is burgeoning so quickly, in fact, that technology Germany already gets half of its electricity from solar power; powerhouses Google and Apple are making huge investments in solar power; and in African nations where access to electricity is a problem for hundreds of millions, solar power is seen as the solution. As it continues to become more efficient and less expensive, solar power is increasingly looking like the energy production resource of the future, you may still be wondering how it works. Here is what you need to know. 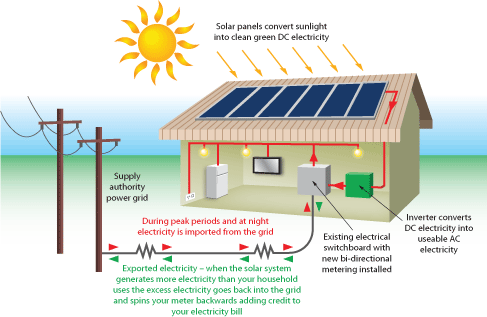 The process for how solar powered electricity works is very straightforward. The sun radiates many different types of energy down onto the earth. One of these is known as photon energy (particles of electromagnetic radiation). Solar cells absorb this energy, which is converted to electricity inside of the solar panels. The newly created electrical energy is then sent to your home or business to power all of your lights, appliances and electronics. The process for indoor heating and generating heat for hot water is also a straightforward one. In this process, the solar cells absorb the thermal energy delivered by the sun; this is then sent to the hot water heater or heating system. In most areas, any excess power that your solar panel system generates is sent to the local power grid; in exchange, your local energy company pays you the market rate for the electricity. First a semiconductor is obtained, or produced from several chemical compounds (usually either silicon or gallium arsenide). 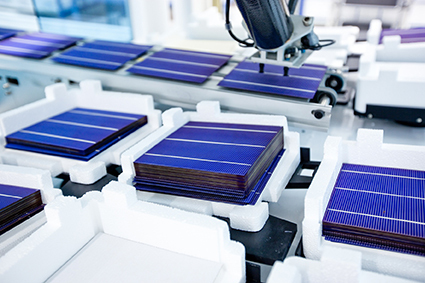 The semiconductor material is then molded and sliced into solar cells. 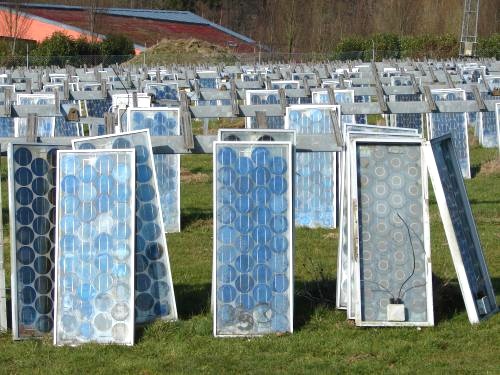 The individual solar cells are connected to become a part of a unified power network. After this, sheets of special plastic, known as concentrators, is placed above the solar cells in order to focus the suns rays for better energy collection. One of the major benefits touted by solar power advocates is its ability to produce energy without any waste or emissions -- most other energy solutions, including coal, natural gas, oil and even hydropower, interfere with the environment in some way as they produce energy. While it is true that solar panel systems can generate electricity and heat without creating any waste, solar power is not entirely clean. The rarely discussed production process of solar panels produces a great deal of toxic waste. In California alone, solar panel production created 46.5 million pounds of sludge and water contamination between 2007 and 2011. As you can imagine, the effects of this waste are disastrous -- according to the European Commission Environment Directorate, the soil, water, vegetation, animals and ultimately us humans are all adversely affected by sludge. While the federal government, California and other solar panel producing states have taken steps to reduce the amount of pollution caused by the solar panel production process, most of what they do involves regulatory laws -- and severe penalties for not following them. As such, it is still up to the solar panel manufacturers to find an effective solution for getting rid of the hazardous waste. Whether you produce solar panels or some other product that results in a hazardous waste byproduct, the key to cleaning everything up is to find the right hazardous waste disposal company. These organizations not only cost less, but they also have the professional expertise to streamline the process, so that you will not spend too much money on the waste removal process. Are you ready to live in a solar powered future? The simple, efficient, cost effective manner in which solar power solutions are produced and operated make this technology an outstanding resource for powering our future. It is so good in fact, despite the drawbacks inherent in its production process, solar power technology still presents the best solution for delivering electricity and heat to the masses. Recognizing this, many states are supporting solar power initiatives with solar lease programs, grants and even publicly run solar development projects. Whether you plan on producing solar panels or simply taking advantage of them for your home or business, be sure to find out about what local and national programs are available to help you minimize the costs of investment.